How does Smart Manager calculate remaining battery time in Samsung Galaxy Tab-A? Smart Manager analyzes the battery consumption pattern periodically. The usage time remaining is estimated by learning your usage pattern for a few days. Usage time left may vary depending on your device settings and operating conditions. What is Smart Manager application in Samsung Galaxy Tab-A ( SM-T355 ) ? How to use Smart Manager application in Samsung Galaxy Tab-A ( SM-T355 ) ? Why Battery remaining time is not displayed immediately after booting in Samsung Galaxy Tab-A ( SM-T355 ) ? 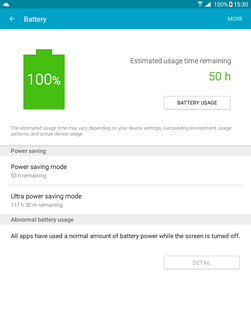 Can the Battery remaining time be updated by changing device usage pattern in Samsung Galaxy Tab-A ( SM-T355 ) ? Is battery remaining time changed after charging in Samsung Galaxy Tab-A ( SM-T355 ) ? How to create folders on the Home screen in Samsung Galaxy Tab-A(SM-T355)?